The first stage of Grand Park in downtown Los Angeles is open to the public. Since its inauguration in late July, it has become an instant winner. Families with children flock to it during weekends; workers from surrounding government buildings come for a lunch break; senior citizens choose a shady spot to read a book or contemplate; young couples hold hands and make plans for the future. Neighbors walk their dogs. The springs and interactive jets of the extended fountain excite children, who come to play in a safe water environment that’s a quarter-inch deep, while their parents take a moment to relax. The park is a first step in the right direction. It responds to local needs and it will help to attract more people to chose downtown as their place of residence. In spite of its haughty name, which derives from its adjacency to Grand Avenue, Grand Park is a relatively modest 12-acre urban park. In cities like Buenos Aires or Palermo it would be a neighborhood “plaza,” a block or two of green open space with walkways and benches, surrounded by a built environment. To compare it with great parks like New York’s Central, Chicago’s Millennium, Paris’ Bois de Boulogne or London’s Hyde Park would be misleading. Grand Park’s importance resides on the fact that it is a model that many cities and neighborhoods with limited budgets and adverse conditions could emulate. The park’s designers, Mark Rios and Tony Paradowski, of the LA firm Rios Clementi Hale Studios, had to deal with a number of difficult premises: 1. a 30-foot level difference between Spring Street and Grand Avenue; 2. the imposing presence of the Hall of Administration and the County Court House; 3. access ramps to underground parking; 4. Broadway and Hill Streets slicing the area in its midst; 5. access to the Metro Red Line subway station; and 6. the existing 1960’s Arthur J. Will Memorial Fountain, not quite a design landmark, in spite of having played background in Pretty Woman. 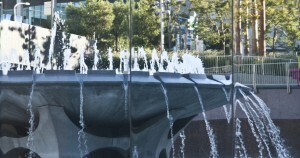 The fountain’s remodeling and expansion is the leading component of the new design. It touches all senses. It draws attention away from the unappealing government buildings framing it. It is “the piano” of a concerto that includes in its orchestration mobile magenta chairs and tables; entrance signs-totems carved with “the park for everyone,” in 25 languages, designed by Sussman/Prejsa; gardens with 140 species of plants, including drought-tolerant ones organized into six “Florist Kingdoms;” 300 new trees; access ramps for the physically impaired; a stage for performances; and night lighting of the fountain and the entrances’ totems. 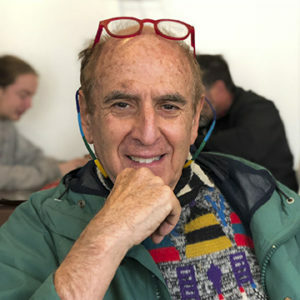 Act Two is still to unfold: the completion of the present rectangular plan by the end of 2012 and enacting a program of operations managed by the Music Center. Act Three is still to be written. It should include the demolition or drastic restoration of the Hall of Administration and the County Court House, allowing the park to be reachable from Disney Hall and from the Cathedral. It could include outdoor public art. 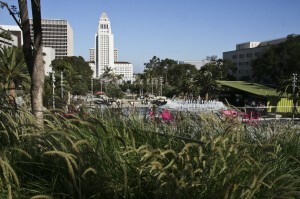 It could turn Grand Park into a great urban park.